Waiting can wear down. 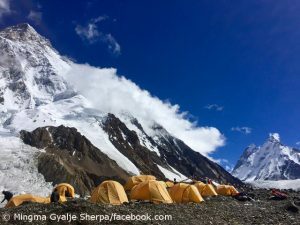 For more than one and a half weeks, the freak weather in the Karakoram prevented major activities on K2, the second highest mountain on earth. A week ago, Mingma Gyalje Sherpa watched from Base Camp a big avalanche, which swept down over the normal route via the Abruzzi spur at about 7,000 meters. The 31-year-old head of the Nepalese expedition operator Dreamers Destination had to give up his plan to check what damage had been caused due to bad weather. Since then, he has been waiting for a summit change at the foot of the mountain, along with his clients and Climbing Sherpas. After all, the first team members left BC today heading for Camp 1. Before, Mingma Gyalje Sherpa answered my questions. Mingma, how is the mood in K 2 Base Camp while waiting for a good weather window? With this monarch is not to be joked. 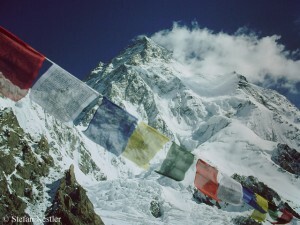 K 2, the “king of the eight-thousanders”, is moody and therefore dangerous. “This morning at 8:12 am, we saw (a) big avalanche coming from (the) Abruzzi route,” Mingma Gyalje Sherpa, head of the Nepalese expedition operator Dreamers Destination, writes on Facebook. The Abruzzi route, following the path of the Italian first ascenders in 1954, leads via the Southeast Ridge of the mountain (look at the picture below, route F). 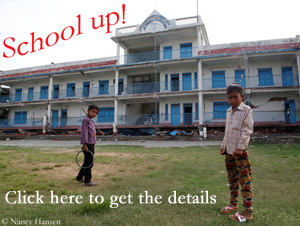 “We feel all (that) Camp 3 (at about 7,300 m) is swept away again. I am sure we have all our deposit near Camp 4 because our Sherpa team made it on (a) ice cliff, but it is likely sure that all the fixed ropes are washed away.” Tomorrow his Sherpa team will go up again to assess the situation.